Patriots-Dolphins Week 14, Key Matchups, Who Has the Razor’s Edge? The New England Patriots head out for the first of their final two road games of the 2018 regular season. They play in Miami this week and Pittsburgh next week in games that will go a long way in determining where they stand in terms of AFC Playoff seeding. The Patriots can clinch their 10th straight AFC East title with a win or a tie and would set a record for making the playoffs in10 straight years. They are currently tied with the Dallas Cowboys (1975-83) and the Indianapolis Colts (2002- 10) as the only teams to play in the postseason for nine straight seasons. This week’s game will be broadcast by CBS and can be seen locally on WBZ-TV Channel 4. Ian Eagle will handle play-by-play duties with Dan Fouts as the color analyst. Evan Washburn will work from the sidelines. The game will also be aired on the Patriots flagship radio station 98.5 The Sports Hub with Bob Socci and Scott Zolak on the call, produced by Marc Capello. The Patriots (9-3) beat the Minnesota Vikings 24-10 in Foxboro as the defense was outstanding limiting the Vikings offense to just 278 yards while rolling up 471 of their own. The Dolphins (6-6) beat the Buffalo Bills 21-17 as Ryan Tannehill threw for three touchdowns in the fourth quarter come-from-behind win. The Patriots and the Dolphins are meeting for the 107th time in their history. Miami holds the overall edge 54-52 with each team holding big advantages at home. Against the Dolphins in Miami, the Patriots are 4-15 in the month of December. The Patriots running game is nearly back to full strength with Sony Michel, James White, and Rex Burkhead as the three main backs in the backfield. 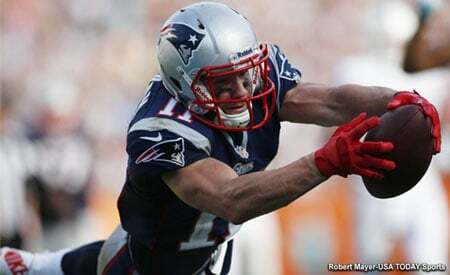 But Julian Edelman and Cordarrelle Patterson both will see some carries on Jet Sweeps. James Develin, their big blocking fullback is now a short-yardage option. He scored a pair of touchdowns last week against Minnesota. 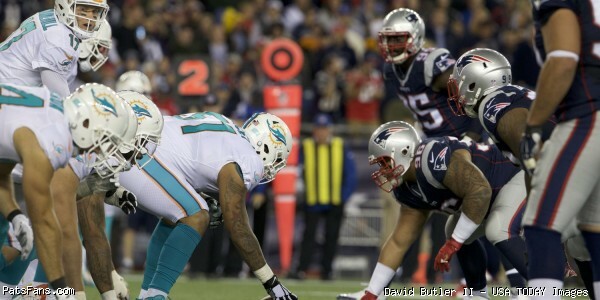 The Dolphins run defense was first gashed by the Patriots to the tune of 175 yards this season after Miami began 3-0. Since then they allowed 164 to the Bears, 248 vs the Lions, 188 to Houston, 195 to Green Bay, and 198 to the Bills. Miami is allowing an average of 144.7 yards per game and 5.0 yards per rush, which is 30th in the league. Look for the Patriots to try to pound the rock all day between the tackles. Miami’s defensive tackles Davon Godchaux and Akeem Spence have not played well against the run and neither have linebackers, Raekwon McMillan and Kiko Alonso. If DC Matt Burke tries to bring the safeties up into the box in run support or blitz the linebackers, it will open up play-action passing. The Patriots passing game has been playing their cards close to their vest lately as their being fairly conservative in the passing game. But in Josh Gordon, Julian Edelman, Chris Hogan at wide receiver, Rob Gronkowski at tight end and James White, Rex Burkhead and Sony Michel out of the backfield, Tom Brady has a plethora of weapons. Add it Patterson and Phillip Dorsett and the depth is there for them to mix it up. Miami may be without their best defensive player in Xavien Howard who has a knee injury. He’s an All-Pro talent who leads the team with seven interceptions this year. With him injured they’ve been forced to play Minkah Fitzpatrick at the other corner with Bobby McCain in the slot. If Howard can’t go, 2nd-year corner Torry McTyer will get the start. Miami has two very talented edge rushers in Robert Quinn and Cameron Wake but they’ll need to get pressure up the middle if they want to be successful there. Look for Brady to utilize the “Pony” backfield with White and Burkhead on third down a lot in this one, they’ll try to isolate the linebackers in coverage and keep the sticks moving. If Howard is indeed out, look for Brady and Gordon to test McTyer. Chris Hogan could be an “X-Factor” this week. The Dolphins running game is averaging 102.7 yards per game (24th) this season with a 4.3 average yards per carry. They have two very good backs in the ageless Frank Gore who leads the team with 616 yards and the dangerous Kenyan Drake. Their problem has been the offensive line hasn’t been on the field enough because of injuries. The Patriots rush defense is currently 13th allowing 106.7 yards per game. They’ve been trending up in that regard and this week, they’ll have their hands full as the Dolphins will try to mix things up by using both Gore and Drake. They’ll have to get a big game out of their linebackers, especially Kyle Van Noy who Adam Gase was talking about this week. Look for the Patriots to go to a bigger front this week with Gore in the lineup and try to get Miami into the 3rd and long passing situations. They’ll have to set the edge this week as the Dolphins should be much more patient with their running game than the Vikings were. The Miami passing game is 28th in the league averaging just 199.4 yards per game. But getting Ryan Tannehill back from injury has helped and in the last two games, he’s had a passer rating of over 100 against the Colts and Bills defenses. He has DeVante Parker, Kenny Stills, and Danny Amendola as wide receivers with Nick O’Leary and Mike Gesicki at tight end with Drake out of the backfield. The team was much more explosive before Jakim Grant and Albert Wilson went on IR. The Patriots defense had their best game of the year last week against the Vikings. The secondary stuck like glue to the receivers and they had constant pressure on QB Kirk Cousins. Can they do that again in South Florida? I would expect they will try to match Stephon Gilmore on Stills which should be a great matchup to watch. And I’d expect either Jason McCourty or J.C. Jackson on Parker with either McCourty or Jonathan Jones on Amendola in the slot. The key is getting pressure on Tannehill and look for the Patriots to attack the middle/right side where the Dolphins OL is banged up and RG Jesse Davis has not played well. Both teams have gotten solid play in the kicking game from punter Matt Haack and kicker Jason Sanders for Miami and Ryan Allen and Stephen Gostkowski for New England. But Sanders gives the Dolphins the edge in the kicking game, especially at home. While Patterson in the return game is always a threat to return a big one. But although Miami misses Grant in the return game, the Pats coverage units have been uncharacteristically very inconsistent. This one is a playoff game for both teams. 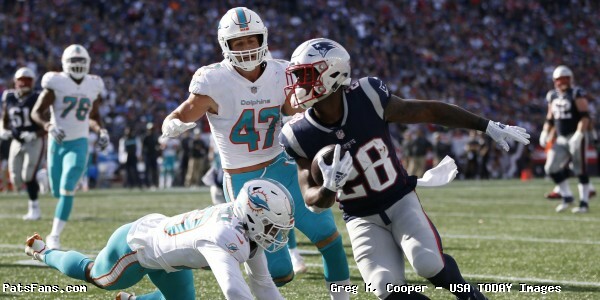 Unlike 2013 and 2015 when the Patriots came limping into Miami beat up, this year it is the Dolphins who are all banged up with injuries while the Patriots are as healthy as one can expect at this time of year. Last year the Pats got caught looking ahead to Pittsburgh and got their butts handed to them. But last year they afford that loss and keep the #1 seed as long as they beat Pittsburgh the next week. This year they don’t have that luxury and they know Miami still has a shot for a playoff berth. Miami isn’t good against the run and they’re ranked 30th for a reason. Spread the wealth between the three RBs and keep their defense on their heels. Plus it will open up play action and slow down their edge rushers. Miami isn’t an offense that scores a lot of points, they can’t afford to get into a shootout situation. Their 29th in offense and 29th in defense. They are still in the hunt because they force a lot of turnovers. Make them go the length of the field with no easy scoring drives is a win-win situation. Dolphins QBs have been sacked 31 times this year, the offensive line is suspect. Especially in the center and on the right. The Patriots don’t have a lot of sacks this year but they are among the top teams at creating pressure. They need to do that and force Tannehill into making mistakes. When they’ve lost to Miami down there, he was standing flat-footed in the pocket for much of those games. This entry was posted in 2018 Patriots Regular Season, NFL Commentary, NFL News, Patriots Commentary, Patriots Film Room, Patriots News and tagged 2018 Patriots season, Bill Belichick, Buffalo Bills, Cameron Wake, Chris Hogan, Danny Amendola, Dont'a Hightower, Frank Gore, Julian Edelman, Kenyan Drake, Kyle Van Noy, Miami Dolphins, New England Patriots, NFL, Patriots, Patriots running backs, Rex Burkhead, Rob Gronkowski, Robert Quinn, Ryan Tannehill, Tom Brady, Trey Flowers, Xavien Howard on December 7, 2018 by Steve Balestrieri. First things first, and we’ve said this many times in the past, however this time the script was flipped. The score is far from indicative of how the game played out on the field. Miami dominated this one from start to finish in all three phases of the game. That the Patriots were still within striking distance late in the game to attempt an onside kick was a testament to their resiliency because they really had no business winning this game. It was a very disappointing effort on all accounts as they had an opportunity to wrap up the division with a win and played their worst game in the past two months. Tom Brady had what he characterized as his worst game of the season, which is pretty accurate. The Dolphins switched up their defense, took away the middle of the field, and were getting constant pressure on him while their corners completely shut down the Patriots wide receivers on the perimeter. Brady was forced into forcing low percentage passes down the field. He was picked off twice and nearly had a third. He was forced to throw to the backs time and again because he had nowhere else to go.It was a very frustrating night for the team and its quarterback. It didn’t help matters that the offensive line wasn’t having a good night either. The Patriots were 0-11 on third down and Brady’s ability to slide and move in the pocket was the only reason the Dolphins didn’t have half a dozen sacks. The Patriots didn’t run the ball effectively enough and then abandoned the idea way too soon in the second half. Dion Lewis and Rex Burkhead had just 10 carries between them, James White had one. When the offense, which has been so balanced falls into that kind of ratio, bad things can happen and on a night where their top two receivers (Julian Edelman and Rob Gronkowski) weren’t in the lineup…bad things abounded. Lewis had a fantastic one-handed stab of a pass Brady floated out when the Dolphins blitzed and Lewis, running a wheel route turned it into a 20-yard gain. Burkhead turned one screen into a 23-yard play and had a nice run behind a block from James Develin into the first touchdown of the game. James White made a really nice catch on a low throw from Brady and was able to keep his balance and dove for the pylon for a touchdown. The wide receivers probably didn’t get the memo that the game started at 8:30 because they didn’t show up and then barely at that until the second half. Xavien Howard completely shut down Brandin Cooks, he wasn’t able to do anything on the Dolphins corner who picked off two passes. He had no catches until late in the game when he snagged a 38-yard pass when Miami had gone to a zone and blew the coverage and left him all alone. Chris Hogan caught one pass for one yard on five targets, being much less a factor in his return than was thought. Danny Amendola had six catches including a nice 23-yard grab where he just came up short of falling into the end zone with just under two minutes to go in the game. Had the onside kick worked, it would have been a much bigger play. No Rob Gronkowski this week equated to zero production from the tight end position. With Gronk out, the Dolphins left a safety in the middle and Dwayne Allen and Jacob Hollister were not able to make any production at all where it was needed most. Allen was targeted five times although not all of Brady’s throws were on the mark. He ended up with two catches for 10 yards. Not nearly enough. The offensive line had a night that they’d rather forget although, with Dante Scarnecchia as their coach, they’ll hear about it this week. The running game rushed for 25 yards, Brady has hit hard all night and the Dolphins blitzes weren’t being picked up nearly as sharply as they should have. The fact that Brady was sacked only twice speaks much more about his ability to move and slide in the pocket and unload the ball than it did about their ability to protect him. The bad night was shared equally. All of the members were getting beat at different times on Monday night. Ndamukong Suh had a very strong game, he overmatched them inside all night long. The defensive line was thin, missing Trey Flowers and Kyle Van Noy who plays both on the edge and as a linebacker. Then Alan Branch went down with a knee injury, tried to come back and left for good. That left Deatrich Wise, Adam Butler, Lawrence Guy and Eric Lee playing a lot of snaps with little rest. That is an awful lot of inexperience there. Only Guy has played in the league longer than this season. And he had a terrific game and really stepped up his play. He had two run stuffs and nearly had a pick-six when Jay Cutler literally threw the ball right to him on a botched screen. Butler had a few flashes, especially late in the game when the defense stiffened in the fourth quarter, but the run defense was gashed by Kenyan Drake and their inability to set the edge hurt. Lee was caught a few time not doing that, and for a guy with three games of experience in the NFL, that is what happens when the next man up mantra gets overused. No pass rush to speak of, Cutler was way too comfortable for most of the night. This unit needs to get healthy quickly this week. Elandon Roberts had arguably his best game as a Patriot two weeks ago against Miami but the script was flipped on him this time around and he had one of his worst. Due to injuries and David Harris being a healthy scratch, it was just Roberts and Marquis Flowers for the majority of the night. The run support wasn’t great, (Roberts’ specialty). Matt Patricia called a run blitz and instead of stuffing it behind the line, Roberts whiffed (a common occurrence all night) and Drake ran for 26 yards. Miami isolated him with Drake split wide and the results were what one would expect. That isn’t Roberts fault, the Patriots often do the exact same thing. It is up to the coaches to get him some help. Letting the speedy Drake run a 47-yard fly on Roberts is a win for Miami. Marquis Flowers had a forgettable night but did have one nice stop on Drake for a loss. Trevor Reilly made a cameo. The secondary had its weakest game in the last two months. Malcolm Butler had a very rough night. He was burned by 5’6 wide receiver Jakeem Grant for a 25-yard touchdown and should have given up another. Grant flew by him and was wide open. Cutler put the ball perfectly in his hands and Grant dropped it. Stephon Gilmore and Jonathan Jones were simply okay and not playing anywhere near the level they had been in the past month plus. The players looked like the dreaded communication issues were resurfacing with all of the crosses and bunch formations Miami was running. Pat Chung got faked out completely on a beauty of a spin move by Drake…that is one you just tip your hat to the foe. Devin McCourty was solid and came unblocked on a blitz where he made a big sack of Cutler keeping the Patriots close. Jordan Richards came on another similar play and whiffed completely, resulting in a first down and later a Miami touchdown. The star here was Ryan Allen, who had his best game in quite awhile. He had a strong 46.4 net punting average with incredible hang time which really limited Miami’s ability to return the ball. He dropped several inside the 20. That fact alone kept the Patriots hanging around late in the game. Stephen Gostkowski hit both field goals and his kickoffs once again were outstanding, Miami’s kick return game was stifled by excellent coverage. The Patriots return game was stuffed completely as Miami’s coverage units were likewise outstanding. What in the world was up with that onside kick? That had to be one of the uglier attempts I’ve seen, rivaling the Colts fake punt. Ugly design, uglier execution. Bill Belichick was outcoached by Adam Gase, something that doesn’t happen all too often. The team came out flat and seemed unprepared. They usually have one of these type of games every year but this was the worst of all possible times to have that happen. Josh McDaniels had some curious play calls and abandoned the run far too soon which seemed a bit of a panic move especially with the team down only three at the half. Matt Patricia’s MASH unit on defense was gashed both on the ground and in the air. But he did what he had to do, got creative with some blitzes and the defense made five straight stops late in the game to give them a chance to come back. This entry was posted in 2017 NFL Season, 2017 Patriots Season, Patriots Commentary, Patriots News and tagged 2017 Patriots Season, Bill Belichick, Chris Hogan, Danny Amendola, Dion Lewis, James White, Jarvis Landry, Jay Cutler, Kenyan Drake, Malcolm Butler, Miami Dolphins, New England Patriots, NFL, Patriots, Patriots edge rushers, Rob Gronkowski, Tom Brady, Trey Flowers, Xavien Howard on December 13, 2017 by Steve Balestrieri. Yes, we know how short-handed the Patriots were on Monday night, missing several key players and losing another in the first half, but that wasn’t the story on Monday night in Miami. The Dolphins were the team ready to play on Monday night and it showed. They dominated in all three phases of the game and the final 27-20 score doesn’t do justice to how much they pressured and stymied the Patriots offense. Monday night was the Patriots worst game since their early season struggles. They were sluggish from the opening snap and Miami’s offense set the tone early. The Dolphins were running short crossing routes and the Patriots defenders were having trouble with their communication and the crossers and rub routes were very effective. Jay Cutler didn’t resemble anything close to the aging QB who has struggled all season in South Beach and had arguably his best game of the season. Cutler, scraggly neck beard and all, even showed some fire on the field as he beat New England for the first time in his career. Play Calling Curious: Josh McDaniels abandoned the running game far too early in this one. Despite being dominated in the first half, the team was down only 13-10 at halftime. The last time the two teams met, New England rushed for nearly 200 yards. To only give your running backs 10 carries? Curious. Late in the game, needing two scores, Danny Amendola was tackled right near the goal line giving the team first and goal at the one-foot line. Rather than attempting to run it in, they passed, steadily moving backward until they faced a 3rd and goal from the 15-yard line. They kicked a field goal but the onside kick was comically bad and Miami recovered and killed the clock. But had they scored a touchdown there, a field goal would have been all that was needed to tie the score. Very un-Patriot like. Offensive Line Issues Abound: With the running game an after-thought, the Patriots offensive line was not up to the task of protecting Brady. 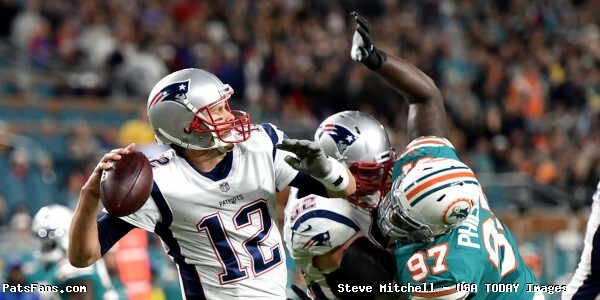 Miami was blitzing all night, normally a sign that New England would be eating them up offensively, but not tonight. Brady was under duress from all points of the compass and pointing the finger at just Cameron Fleming is wrong. They were beat all along the line and the communication there wasn’t the best. The worst part is, the pressure Miami was bringing was right up the middle, not allowing Brady to step up enough and throw in the pocket. Dolphins Secondary Dominates: Miami did a great job of taking away the middle of the field. Granted, that is a spot where Gronkowski normally dominates, but other than passes to the running backs, Brady and the wide receivers were never able to get anything going in the middle of the field until very late in the game. Xavien Howard erased Brandin Cooks tonight, and intercepted Brady twice. Cooks was shut out until the fourth quarter when the Dolphins dropped into a zone and had a bad bust in coverage. But holding Cooks and Hogan to one catch a piece is a big win for their secondary. Danny Amendola ended up with six catches with all of them coming in the second half. Miami forced Brady into his first two-interception game in the regular season since 2015 against Philadelphia. And the Patriots were an astounding 0-11 on third down. Brady Battered and Flustered: Tom Brady was hit hard again and this time, the effects were shown. He finished 24-43 for 233 yards with one touchdown and two picks. His QB rating of 59.5 was his lowest since 2013. Unable to convert a single third down and a combined 2-12 when targeting Cooks and Hogan, Brady was unloading those low percentage deep balls time and again. In the first quarter, the Patriots got two (2) yards of offense. Two, that is not the way you want to start. In the second half, they got away from targeting the running backs as they were forced to stay in and help with pass protection. Kenyan Drake Shreds the Defense: The former Alabama third down specialist is now an every-down back and he’s electric. The Dolphins wanted to get him the ball more as he’s got tremendous speed. And his array of moves was on full display tonight. He faked Pat Chung with a spin move leaving Chung holding air that was amazing. And once he hits the hole, if the defense doesn’t lay a hand on him, he has the speed to take it to the house. Drake finished with 25 carries for 114 yards and five catches for 79 more in the passing game. They split him out wide and isolated him on Elandon Roberts which is a total mismatch. While Roberts has issues in coverage, asking him to cover Drake deep is a win-win for Miami. He burned Roberts for a 47-yard gain deep down the right sideline. If Drake can hold up physically, he’s going to be an intriguing member of the Fins to watch next year. Butler Has Rough Game: Malcolm Butler had one of his least memorable games in Miami tonight. He was constantly behind in coverage and was beaten badly by Jakeem Grant a couple of times, one for a 25-yard touchdown and on another on a deep pass by Cutler that was perfectly thrown and the wide-open Grant dropped it. Butler is going to have to have a very short memory this week as he’ll be facing Antonio Brown this week in Pittsburgh. And judging from the game Brown had on Sunday and Butler had last night, the Steelers will be going to the well early and often against Butler this Sunday afternoon. Branch Injury Leaves Defense More Depleted: The Patriots defensive line took another shot as Alan Branch injured his knee in the first half, tried to return but left for good leaving an already depleted defense even thinner. Facing the Steelers offensive line and Le’Veon Bell on a short week, if Branch is unable to go, that will be a huge loss. Right now they have Malcom Brown, Lawrence Guy, and Adam Butler inside, with Guy playing some on the edge as well with Trey Flowers and Kyle Van Noy out. Vincent Valentine hasn’t even begun practicing yet so expecting help from him this week is not going to happen. The Patriots simply were outplayed from start to finish in this one. Miami was hungrier, more motivated and came out with a purpose. This is what we expected from New England. So the Dolphins are alive for one more week and the Patriots still hold their destiny in their hands. With a win over the Steelers, they’d still own the #1 seed. We’ll have more on this game later in the week. This entry was posted in 2017 Patriots Season, NFL Commentary, Patriots Commentary, Patriots News and tagged 2017 Patriots Season, Bill Belichick, Danny Amendola, Dion Lewis, Jay Cutler, Kenyan Drake, Malcolm Butler, Miami Dolphins, New England Patriots, NFL, Patriots, Pittsburgh Steelers, Rob Gronkowski, Tom Brady, Xavien Howard on December 12, 2017 by Steve Balestrieri. 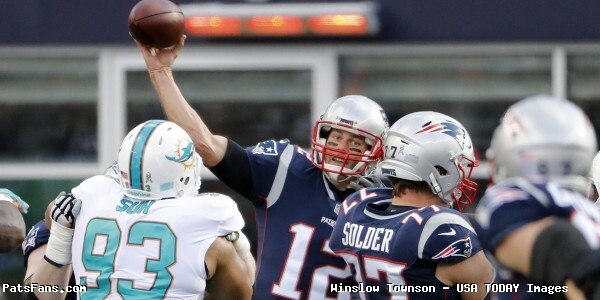 Patriots – Dolphins Keys to the Game, Who Has the Razor’s Edge? The New England Patriots will play their home opener of the 2016 NFL season at Gillette Stadium against the Miami Dolphins on Sunday at 1 p.m. The game will be televised by CBS and can be seen locally on WBZ with Greg Gumble and Trent Green handling the play-by-play and analysis duties. Jamie Erdahl will work the sidelines. The game will also be aired on the Patriots flagship radio station 98.5 The SportsHub with Bob Socci and Scott Zolak on the call, produced by Marc Capello. The Patriots (1-0) defeated the Arizona Cardinals 23-21 on Sunday Night Football as Jimmy Garoppolo was impressive in his first NFL start throwing for 264 yards and a touchdown. LeGarrette Blount ran for 70 yards and a touchdown. Arizona’s Chandler Catanzaro missed a 47-yard field goal with under a minute to go. The Dolphins (0-1) lost to the Seattle Seahawks 12-6 when Russell Wilson connected with Doug Baldwin for a game-winning touchdown pass with less than a minute to go. Miami had chances to win with a field goal being blocked, a fourth and inches attempt failing from the Seattle 17-yard line and Kenny Stills dropping a sure-fire 71-yard score. The Patriots and Dolphins will be meeting for the 102nd time with Miami holding an all-time 53-48 edge. The Patriots hold the all-time edge in home games 33-18 and hold a sizable advantage at Gillette Stadium where they are 12-2. The last three years have seen the series split along home lines with each team holding serve on their home field. The Patriots crushed Miami 36-7 in Gillette and Miami dominated in a 20-10 win in the final regular season game of 2015. This entry was posted in Patriots Commentary, Patriots News and tagged Adam Gase, Arian Foster, Bill Belichick, Byron Maxwell, Cameron Wake, Chris Long, Danny Amendola, Devante Parker, Dion Lewis, Dont'a Hightower, Jabaal Sheard, Jarvis Landry, Jimmy Garoppolo, Julian Edelman, LaGarrette Blount, Malcolm Butler, Malcom Mitchell, Mario Williams, Miami Dolphins, Ndamukong Suh, New England Patriots, NFL, Patriots, Patriots edge rushers, predictions, Rob Gronkowski, Rob Ninkovich, Ryan Tannehill, Tom Brady, Trey Flowers, Xavien Howard on September 16, 2016 by Steve Balestrieri. When the Patriots take on the Miami Dolphins on Sunday afternoon at Foxboro, they’ll be looking for their offense to build off of a good game against Arizona a week ago. This week, they’ll face a similar situation, in that they’ll be looking for a way to target an uncertain cornerback situation with Miami. The Dolphins brought Byron Maxwell down to South Beach after a disastrous season in Philly. Misused in a system that didn’t play to his talents, the coaches are looking for him to provide a physical, top cornerback role this season after they jettisoned Brent Grimes this spring. Xavien Howard is the Dolphins rookie starting corner and was the team’s 2nd round pick with the 38th overall selection in the 2016 NFL Draft. He has good size at 6’0, 201-pounds and is physical with very good ball skills. In his first NFL start against Seattle, the Seahawks didn’t try to pick on the rookie as was generally thought and he tied for the team lead in tackles with six. Bobby McCain was a 2015 draft selection for Miami and he started four games for the Dolphins a year ago. He’ll play in the slot. He’s an undersized (5’9), feisty corner with good ball skills. The interesting thing was a week ago, with the game on the line, the Seahawks, targeted him rather than the rookie, Howard. Reshad Jones is one of the better safeties in the league, and depending on Gronk’s availability, will determine how he’s used. Patriots Weapons Match Up: The Patriots have plenty of weapons in the passing game, Julian Edelman and Danny Amendola look healthy and were productive a week ago. Newcomers Chris Hogan and Malcolm Mitchell both had their moments and should see their roles increase as the season wears on. Tight end Martellus Bennett, was used primarily as a blocker a week ago but can be moved around the formation depending on the matchups and RB James White is very effective coming out of the backfield. The big question will be if Rob Gronkowski is able to play this week. If he can go, the mismatches he creates with the safeties and linebackers has a domino effect down the corners. Gronkowski, like Bennett, can line up inside, in the slot or split wide outside. The matchups favor the Patriots offense here, but the Miami defensive line will definitely have an effect on whether Jimmy Garoppolo has the time to throw. Miami DL the “X” Factor: The Miami DL sacked Russell Wilson three times and got a lot of pressure on the mobile QB so the Patriots know that they’ll have to bring their A-game on the offensive line. Mario Williams, Ndamukong Suh, Earl Mitchell, and Cameron Wake were all disruptive. The plan was to use Wake this season as a situational pass rusher as the edge rusher was coming off of an Achilles injury, but with Mario Williams suffering a concussion last week and unlikely to play, he’ll be pressed into starting on Sunday. Miami held the powerful Seahawks offense to just 12 points on Sunday, but at the end of each half gave up long scoring drives. The first half drive resulted in a field goal, the one at the end of the game was a game-winning touchdown drive with Wilson finding Doug Baldwin in the end zone. It was interesting to note, that Wilson got effective thru the air on that final drive and it just so happened that both Williams and Wake were on the bench at the time. How Will They Choose to Match? The decision on how the Patriots choose to mix and match their receivers will be an interesting choice to watch on Sunday. Will they opt to go smaller on the outside with the quicker Edelman and Amendola to counter the bigger corners of Miami, with the bigger Hogan in the slot? By giving up the size advantage, they gain the quickness outside and may opt to give the bigger Hogan an advantage of working on the smaller McCain inside. Or Josh McDaniels can opt to use the bigger Hogan and rookie Malcolm Mitchell outside and slide Edelman into the slot where he’ll be a handful for McCain and gain the Patriots the edge that they like for those short, moving the chains passes and mix Amendola in liberally both inside and out. I think we’ll see a mixture of both, they’ll be trying to find a weakness to exploit and will try out a variety of different looks to see what works. I think we’ll see Bennett, at least initially being utilized as mainly a blocker again. 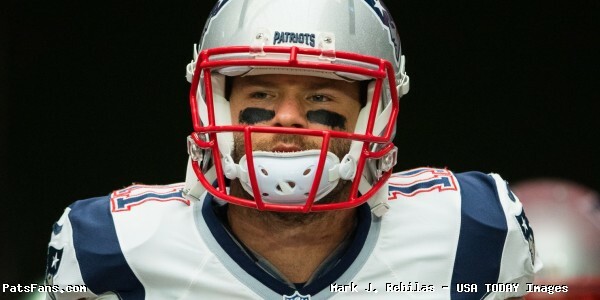 Edelman is the key for both teams here, in the past four games against the Dolphins, Edelman has 33 catches for 403 yards and 4 touchdowns. That’s an average of 8 catches, 100+ yards and a touchdown per game. If Miami wants to turn the tables and upset the Patriots on Sunday, they’ll have to stop or slow him down. The versatility of the Patriots offense will come into play here as they can use any of their WRs in a mix and match role so the Dolphins will have their hands full in the secondary. Like so many other games with Tom Brady at QB, this one too will ultimately come down to time. The Dolphins will try to force Jimmy G. into holding the ball so that their pass rush will wreak havoc on the young QB. If Garoppolo finds the time to throw, then the vast array of weapons he has (especially if Gronkowski plays), will prove to be a mismatch for New England. This entry was posted in Patriots Commentary, Patriots News and tagged 2016 NFL Season, 2016 Patriots season, Bill Belichick, Bobby McCain, Byron Maxwell, Cameron Wake, Chris Hogan, Danny Amendola, Earl Mitchell, James White, Jimmy Garoppolo, Julian Edelman, Malcolm Mitchell, Mario Williams, Martellus Bennett, Miami Dolphins, Ndamukong Suh, New England Patriots, NFL, Patriots, Rob Gronkowski, Tom Brady, Xavien Howard on September 15, 2016 by Steve Balestrieri.